In about a week's time, Chinese communities from all over the world will celebrate the Spring Festival or Chunjie 春节 or Chinese Lunar New Year. 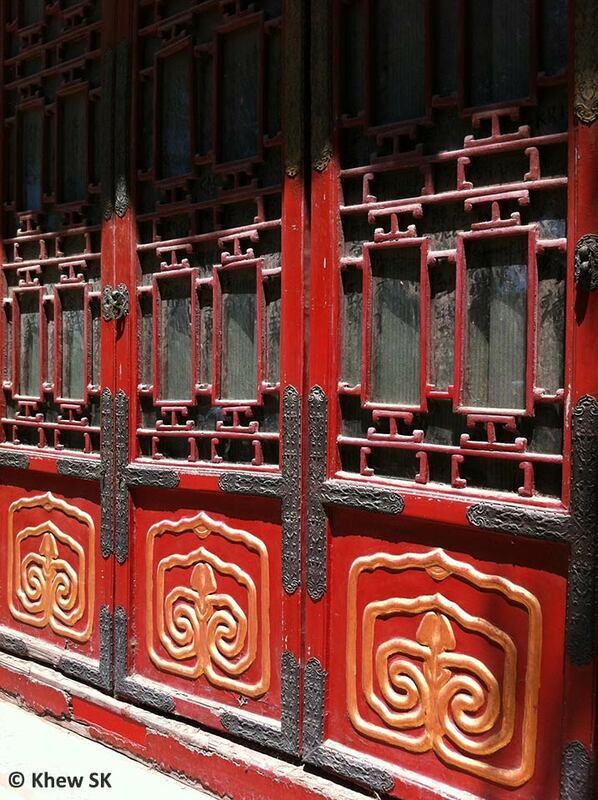 During this period of festivities, red is a favourite colour in most Chinese households and businesses. From new red clothes to red banners to red packets, it is a traditional Chinese belief that red is auspicious. Everyone is encouraged to put a little bit of red in their lives to ensure that they reap some of the prosperity that comes with the New Year. 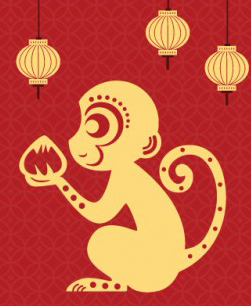 This year, 2016, we will welcome the Red Fire Monkey on 8 Feb. The Monkey is the ninth sign in Chinese astrology, after the goat, and followed by the rooster. The number “9” is associated with ambition, activity, smartness, mischief and adventure. 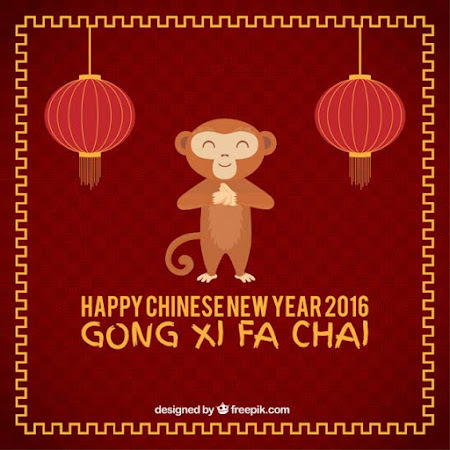 The sheep/ram/goat of 2015 will be making its exit by midnight on 7 Feb, as we herald the new Year of the Monkey. The colour red has a variety of associations in different cultures across religions, nationalities and races. In prehistoric cave paintings, red pigments were extracted from iron oxide or red ochre to depict the then "civilised" world's view of their daily life. Prehistoric man's "blog" of sorts, where he documented on the walls of his cave, anything from a successful hunt to his adventures across unknown lands. In ancient China, red played an important role in the culture of Imperial China. 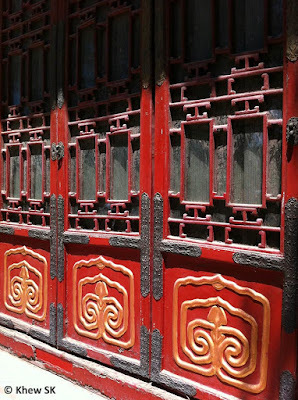 In Chinese philosophy, red represented fire, one of the five elements. During the Zhou, Han, Jin, Song and Ming Dynasties, red was considered a noble colour, and it was featured in all court ceremonies, from coronations to sacrificial offerings, and weddings. Red was featured prominently in architecture, and used liberally on walls of buildings, columns and beams and entrance portals. 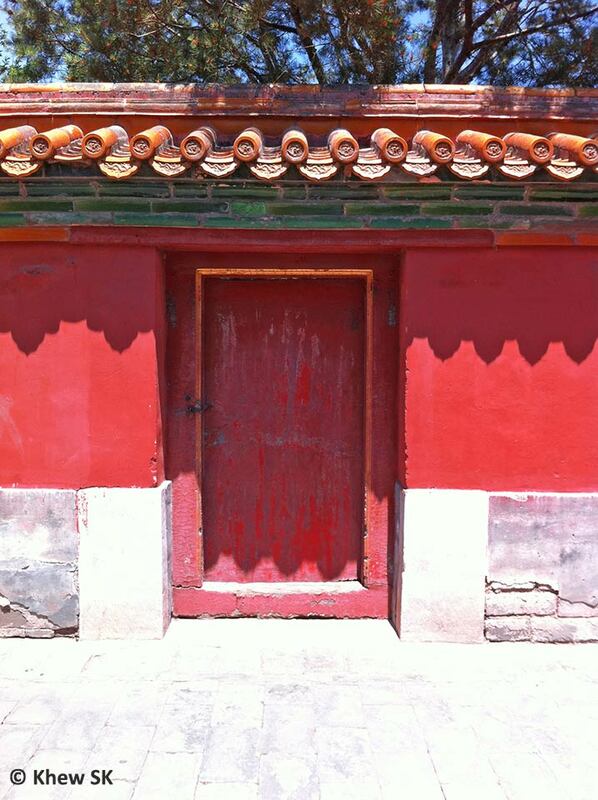 The gates of imperial palaces were usually painted red. The Roman Empire celebrated red as a colour of courage and blood. Roman soldiers wore red tunics, whilst generals often sported large red cloaks. The Emperor Charlemagne painted his palace red and wore red shoes as symbol of his authority. 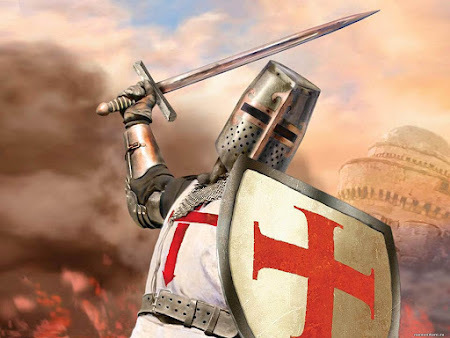 In Christianity it represented the blood of Christ and the Christian martyrs; in 1295 it became the colour worn by Cardinals of the Roman Catholic Church. Red is the colour of extremes. It is often used to symbolise courage, passion, seduction, violence, danger, anger, auspiciousness, celebration, good luck, joy and adventure. However, red is often associated with having a dark side, particularly in Christian theology. It was associated with sexual passion, anger, sin, and the devil (which is often portrayed graphically as a horned being with a tail and totally red in colour). And whenever someone mentioned a "red light district" in a city, it is a part of the city that few people would want to openly associate with. Red is a colour that is most often used on national flags! Did you know that over 77% of the world's national flags contain the colour red? Of the 192 flags of the independent countries of the world, 148 feature the colour red on their flags, including Singapore's which features the colours red and white. What about our butterflies then? 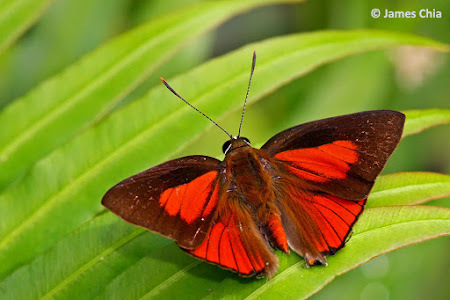 In Singapore, we have a number of species of butterflies that are predominantly red in colour. Their "redness" ranges from a bright red to a deep maroon red. 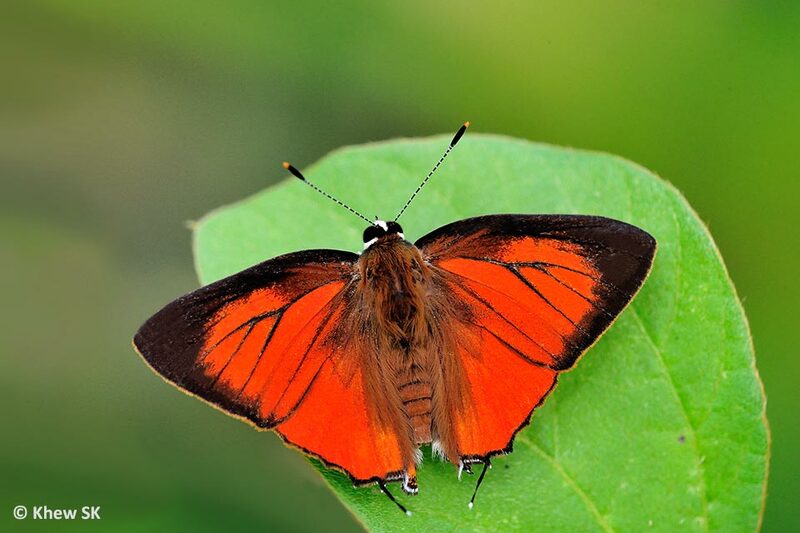 Let us take a look at some of these red butterflies that can be found here in Singapore. The largest predominantly red butterfly is the Commander (Moduza procris milonia). This Nympalidae butterfly features a deep maroon red on the upperside of its wings with a white macular band across both wings. 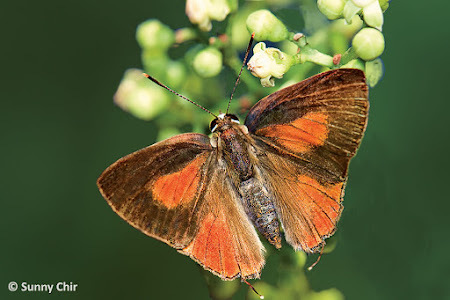 The species is relatively common and is widespread in distribution from the nature reserves to urban parks and gardens. 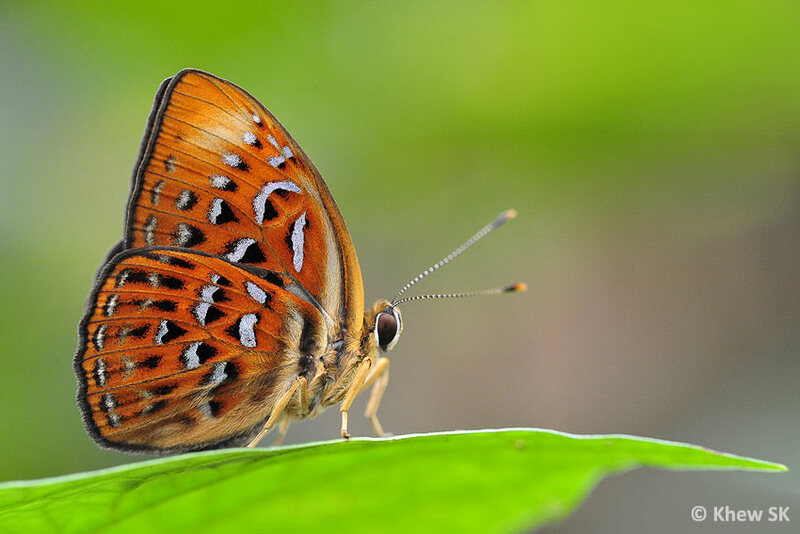 The Lacewings, of which there are three species in Singapore, also have reds on their wings, but they do appear to be more deep-orange rather than predominantly red and are hence excluded from this list of red butterflies. 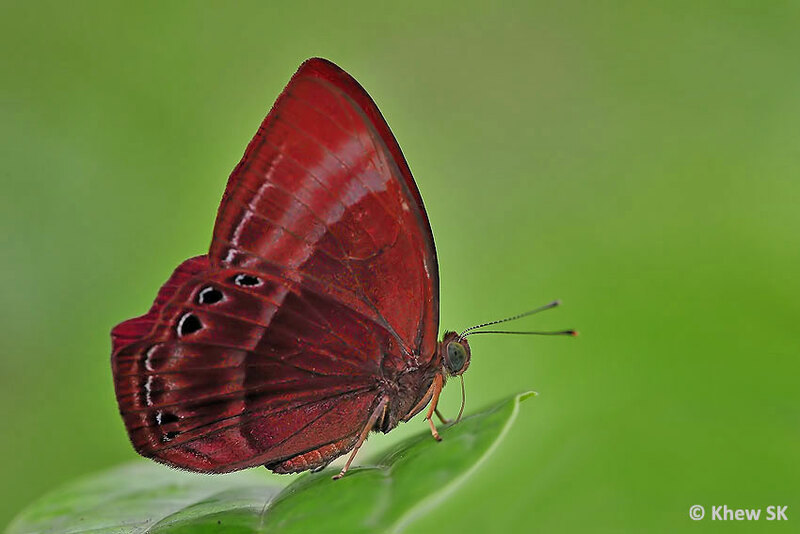 The next group that features a number of red butterflies are from the subfamily Riodinidae. 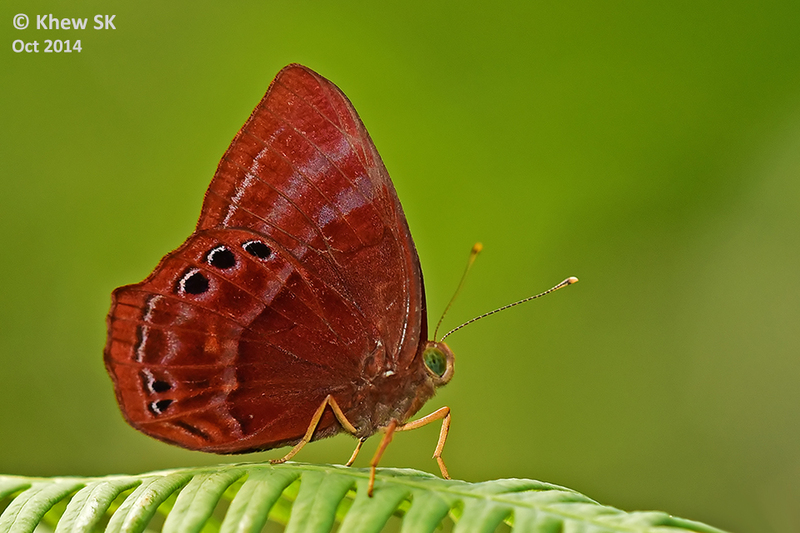 Also known as "Metalmarks", this group of butterflies feature deep red butterflies. 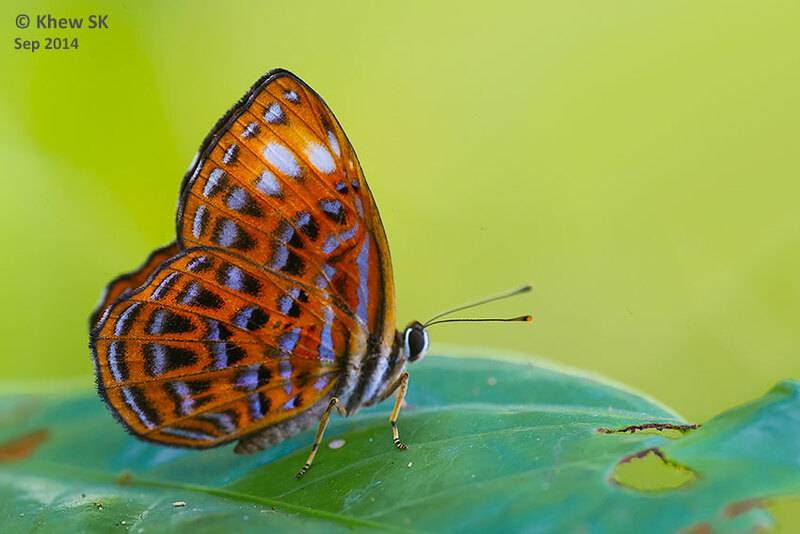 Some species are adorned with blue or silvery spots and marks. 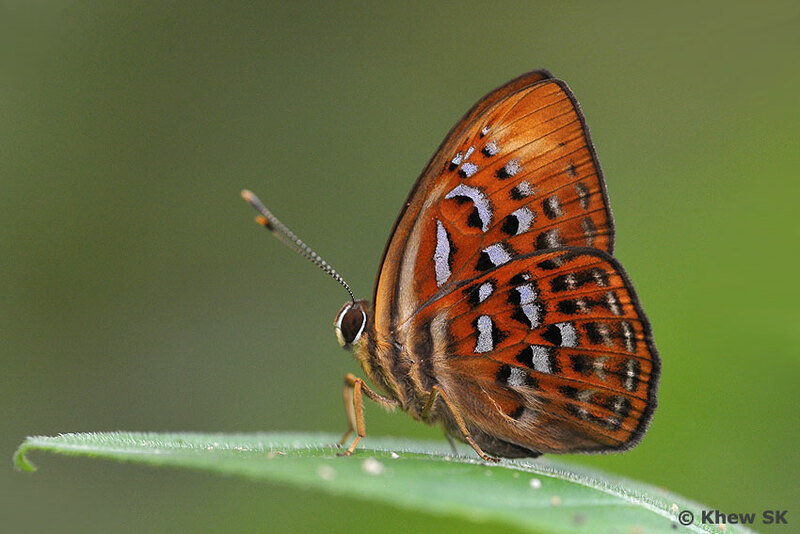 Most are shy forest butterflies that prefer the shaded understorey of the forested areas in Singapore. Amongst the deep red Riodinidae that are found in Singapore are the Malayan Plum Judy (Abisara saturata kausambioides) and the Spotted Judy (Abisara geza niya). Two other members of the family also appear red, but marked with silver or bluish spots. These are the Harlequin (Taxila haquinus haquinus) and the Lesser Harlequin (Laxita thuisto thuisto). 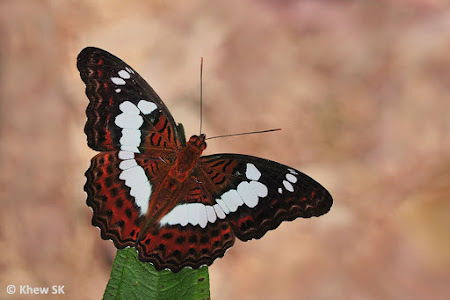 Both are rare butterflies, in particular the Harlequin where it is known from only a single location on Singapore island. 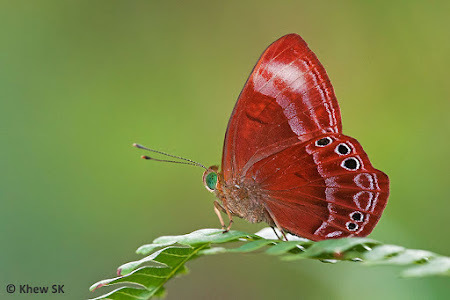 The remaining red-coloured butterflies found in Singapore are small and zippy butterflies from the subfamily Theclinae. Two species from the genus Deudorix are the Cornelian (Deudorix epijarbas cinnabarus) and the Eliot's Cornelian (Deudorix elioti) both of which feature red uppersides with thick black borders. Interestingly, Cornelian (sometimes spelt Carnelian) is a brownish-red mineral which is commonly used as a semi-precious gemstone. 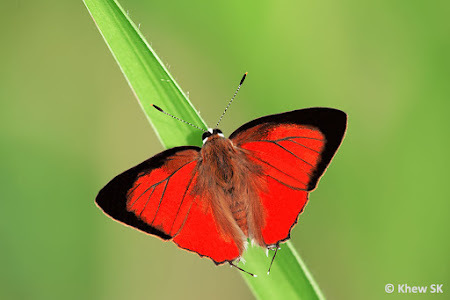 The final group of red butterflies belong to the genus Rapala often referred to as the "Flashes" for their strong rapid flight. The most often spotted and prominently red species is the Common Red Flash (Rapala iarbus iarbus). 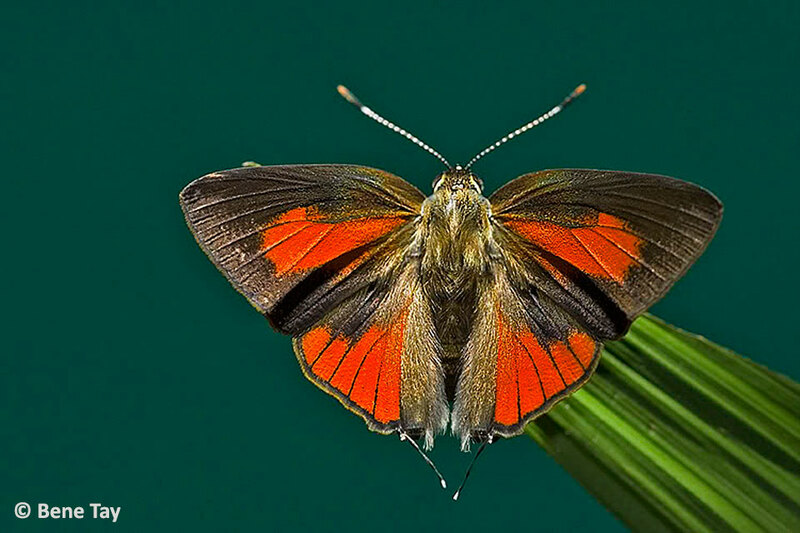 This species tends to open its wings to sunbathe, showing off its red uppersides more often than its closely-related cousins. Of the other Flash species, the males of the Scarlet Flash (Rapala dieneces dieneces), the Suffused Flash (Rapala suffusa barthema) and the Copper Flash (Rapala pheretima sequeira) also sport reddish uppersides. Although not very rare, these species are not often observed to show off their uppersides of the wings very frequently, and hence field shots of these butterflies depicting their uppersides are fairly rare. And so we now know a little more about our red butterflies in Singapore, and whether you choose to display a bit more red in your life this coming Chinese New Year for prosperity and good luck, here's wishing a Happy Chinese New Year and a Gong Xi Fa Cai to all our readers near and far! And we hope that the year of the Fire Monkey will bring good luck, health and prosperity to you in 2016! Text by Khew SK : Photos by James Chia, Sunny Chir, Khew SK, Horace Tan and Bene Tay.